Busy as a. . .
Oh, never mind. That's very timeworn, isn't it. 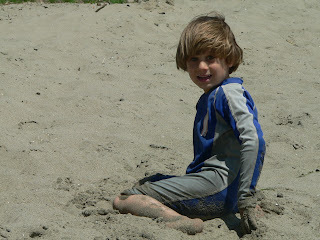 We have been to the local beach for the last three days. Two warm days, yesterday a little like what I imagine being at the beach in Britain to be like. As I huddled behind the windbreak Thing 1 had made, I kept saying, "Isn't this lovely?" and cracking up. Yesterday I went into the two hives I keep here at home, and one is doing well from the bees' standpoint, but rottenly from mine. They are drawing combs across the bars, so it's not a moveable-frame hive. They'll still raise babies and make honey, but it's not as useable for people. And I can't monitor for disease and their space needs. See? It makes me want to cry. My own fault, really, as I didn't give them any starter strips to guide them in straight comb drawing. I'm going to ask around at the bee meeting and see if anyone has any useful ideas. 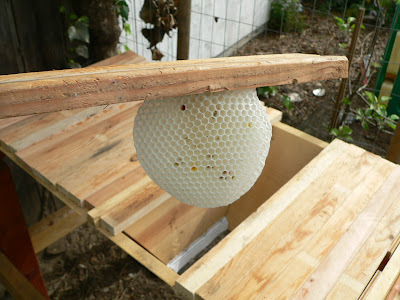 The other hive, the one in which I remembered to put starter strips of beeswax? It's like a miracle. Bar after bar of beautiful comb, straight and thick. The bees are calm and going about their business. 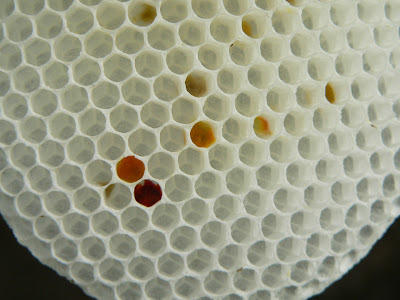 I saw capped brood, little teeny new eggs, and lots of pollen and nectar. Go, bees. I have to check on the other two hives. I also got another swarm call and I'm going to drive out and get them early tomorrow morning. Oh, and as to earlier questions, our back yard, while large for our area, measures about 40x40'. Not huge, but bees are easy to please. I think for now I'll stop with two hives. My sister's house has room for many more. . . Thanks to Thing 1 for the bee pictures. She's feeling much bolder with a veil on. I'm almost to the arm division. Thing 1 says she wants a pretty plain sweater, and this is working out to be just that. I think she'll get a lot of wear out of it, but not unless we have more beach days like yesterday. I think after I get this last swarm sorted, and hived, and finish the work I have to do, I'll have lots of catch-up knitting time. Except that Sunday is my first spinning class. I hustled this morning more than usual and got everything vacuumed and picked up then ran the kids through their math and reading so when the Sainted Miguel came and took everyone to the park, I got in a bubble bath and painted my toenails worked like a crazy woman on my online courses. Then I met a friend for lunch -- a dear friend who acted like it was all her treat to hear my news. Wasn't that sweet? Very soul-restoring. That's how far I am on the right front of the Pearl Buck Swing Jacket. I've made many notes about how I'm doing this, as I can't actually follow a pattern without translating it into Distractionese. This way, the two fronts will at least have a slight chance of greatly resembling each other. I figured out where to put the extra inch of length us long-torsoed folk require. Every time I pick this up I enjoy the yarn more, splitty though it is It's such a treat. I only wish I had killer knit skills so I could show it off in some spectacular way. Fortunately, it's so lovely it will make anything I knit look better. And what more, really, could you ask of a yarn? It's called a package of bees. This is a three-pound package. I didn't knit much today because we took the kids for professional photos here in town. Getting all four looking in the same direction, let alone with semi-acceptable faces was quite a chore. And Thing 4's attention span is pretty small, unless nursing is involved. We'll see how well they turn out. Keeping up with "real" pictures is difficult, since they aren't in the school picture loop. That's probably as believable a reason for not blogging as any. Actually, the dog is still eating things he shouldn't and then vomiting on the rug. I haven't sourced the no-doubt expensive veterinary food for pancreatitis I'm supposed to be feeding him, so I'm still cooking chicken and rice every day. That's been fun. I really did put up a lot of pictures last night, meaning to overwhelm any readers still out there -- hi, readers! -- with pictures if nothing else. But Blogger didn't save the draft and in the meantime I managed to somehow wipe those pictures out of existence. No problem for some, but one? One was the most heart-stoppingly precious picture of my toddler in full rain regalia, and the other? I was planning to enter it in the fair, I thought it was so good. Just one of those "right place/right time" photos. Now? who knows. I may get them; I may not. But I've been busy. Last weekend I helped another beekeeper load some hives for transport and then drove out to another bee group's meeting and picked up two three-pound packages of bees, complete with little queen in a cage. Brought 'em home and took one of the hives my husband built (had pictures of that, too) to a friend's house and installed them there. Then put the other one in my yard. 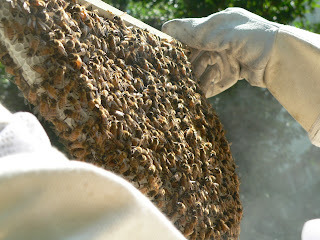 The next day, I got another swarm call, so as I drove out to get them, Eric was busily building another hive. That swarm wasn't in fabulous shape; some kids had apparently spent their spring break throwing rocks at the swarm. I didn't ask the folks what the kids did for winter break: kick puppies? I just gathered up the swarm, which had been knocked half on the ground, and brought them home. Loaded up the hive and all the children and drove that bunch to my sister's house, where they were located up on a shed. Great spot -- it's high and no one walks in front of their entrance, and it's very sunny. So all this week, I've been managing. The day after installation, I checked to make certain that the caged queens had been released by the other bees eating through the candy pellet holding the cage closed. Both had, which is good. One hive kept moving up into the peaked roof of the hive, not down in it, and I kept changing things until I think I got it right yesterday. Then I worked some on the first swarm, now a colony in residence in the chicken coop -- they are drawing comb across the bars. I've also changed how I start the bars, giving them a well-waxed in starter strip to avoid this in the other hives. But for this one, I'm doing all sorts of things, up to and including tying a piece of comb on straight that I'd knocked off. With work, I think I can straighten it out. I'm looking forward to getting lots of good pictures because a second veil came on order, so a family member can shoot pictures with less stress. These hives are just different than the typical ones, and there's a lot to learn. Then I've been swamped with grading for my classes, and there is still a bunch of papers awaiting my reading and commenting. It's not their fault it's swarm season! And the college wants me to edit those lectures. Haven't even opened those files yet. My spouse has had a couple of the worst work weeks in his life, and he's been needing some care. We're hoping the bad patch is over. Garden is growing, and I had some pretty pictures to show those of you still in snow: a cornflower in full bloom, lovely Lacinato kale (must seed more of that; it's the only kind my family likes, and it's actually tender fresh-picked), Heuchera surrounded by red lettuce, and some tomato blossoms. Don't hate me because I live in a lovely microclimate! And I knit a whole pattern repeat's worth on the right front for March's Pearl Buck Swing Jacket on a drive today. The yarn is so wonderful it's just a pleasure to work with. I wish I had more time to sit and pet it as I knit. I want to wear this sweater! The round-yoked one has gotten a thumbs-down from Thing 1. Doesn't fit right, and she'd rather have a one-color raglan with collar and cuff accents. Can you say yeah? If I get on that, I might just get it done. My mindless-knitting, yarn-eating garter stitch red shawl is 1.5" long. That's feeling nice. So I wrote to the tech columnist in the local paper hoping for some help recovering those pictures. If none comes, I may call Microsoft (perish the thought) or even call a professional. Maybe the camera folks can help. I might be able to get them back off of that chip? Anyhow, it's worth a try. And there are always new days to take more pictures. 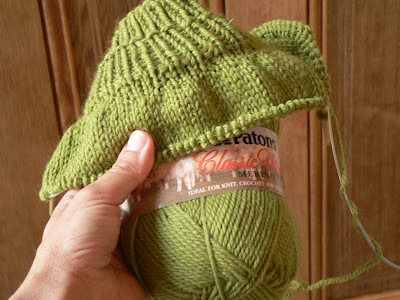 using E. Zimmerman's percentage system from a knitlist pattern for Thing 1. I'll let you know what I think of it when I'm done. I'm using Paton's Classic Wool, and it's probably going to need a mock turtleneck under because it's a little scratchy and the neck is close-fitting. 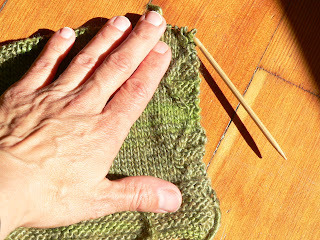 The colorwork is going to be a mix of stripes and stranded patternwork done with a coordinating self-striping yarn. I don't know how it's going to work, but the benefit is that it's fast enough to rip it out and redo if I don't like it. 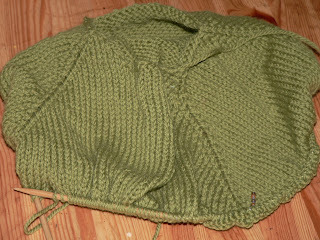 The collar looks wonky because it's going to be folded (that ridge is the purl turning ridge) and sewn down. After biasing the last hem I tried to knit in, I figured that I'd rather sew it later, and I wanted to make absolutely certain, after the fiascos with the orange sweater, that it was loose enough to slip over her head without drama. and found pollen to put in it. But who knows what goes on in the minds of bees? I was bummed, to say the least. Then I had the brilliant (to me) idea of posting a "swarm wanted" post on Freecycle and on Craigslist.org. Soon enough, the emails started pouring in. Unfortunately, they were along a few different lines: "I'd love local honey; my husband has allergies," "I used to have a swarm, but they flew away," and my favorite (and still ongoing) one, "I'm making a film about Freecycle, can I come when you get one?" So I just resigned myself to waiting. Yesterday is our big out of the house day. I even left early for Park Day with the homeschoolers. You know, an old house with four messy children, two not-completly-neat-but-not-as-messy-as-the-kids adults, and pets, needs daily vacuuming. The Hoover canister that I got second-hand probably wasn't meant for this kind of work. I had gone to the local vacuum store and drooled over the Mieles, but had talked myself out of the expense. I figured I'd just get along with the old one for a bit longer. The carpet beater head on the Hoover started smoking yesterday morning. Since the whole vacuum was now also randomly turning off, I deemed that the Last Straw, and hied me to the vacuum store. I walked in and said, "I want the least expensive, large-capacity Miele you have." I think he was a little stunned, but I don't like to mess around when my mind's made up. Unfortunately, the box wouldn't fit in the bike trailer, so I left it there for later. After a full day of play, I biked home, jumped in the car, went back to get the vacuum and pick up a quick dinner, and finally checked my email. This morning at (yawn) 6 am, I was back, with reinforcements in the form of a full (new) bee suit, new gloves, clippers for the branch, bee brush, camera, and my grandma's sheet. I also figured out a way to tie my veil that perhaps is the proper way, as it makes a firm seal around the veil part and my shoulders. I felt much more confident. Finally, I pushed as many as I could manage to inside the entrance hole and took the low-tech hole cover and sort of scooped them along, figuring that they'd rather be with the queen and their sisters than my grandmother's sheet, nice though it is. Brought 'em home, dumped 'em in, and have left them alone. I managed to bring one in on my veil, I think, because as I was nursing the baby, I felt those tell-tale little feet on my neck. So I slowly and carefully got up tossed the baby to her father and shrieked my way around the room until it flew off, then we took it outside. There are some still hanging out in the small box, and I'm afraid they're going to get very chilled, so I'll go out tonight and finish putting them all in. Cross fingers for them staying, and for more swarms. We're planning to build more hives this weekend. Oh, and maybe knit too. Today is my mother's birthday. You would think after so many years I would have gotten a card in the mail on my birthday to make it to her house five days later, but no. So, happy birthday again, mom. You're the best. Thank you everyone for your nice words. I apparently either have a high pain threshold, or bee stings don't hurt as much as I remember them doing. I realized that my Benadryl threshold is still quite low, as I fell asleep in the bath after taking two of them. I was trying to counteract any swelling, but my jaw is still puffy and I'd rather be puffy than dead, so I won't be doing that again! This morning, just my spouse and I made the trek to check on the bees at the swarmed house. One advantage to slightly older children and their older friends is that I can run errands without worrying about the kids. This house -- how I wish I'd brought my camera. It was in a very very nice part of town, and these people have more money than I, or anyone I actually know, does. Anyhow, they also had a low-hanging swarm of bees. 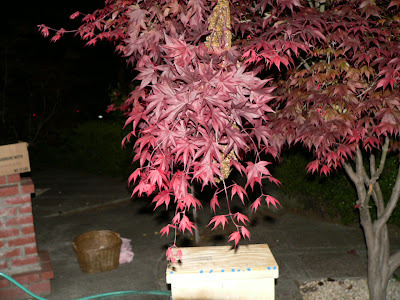 When we got there, the bee box was covered on one side with a pile of bees, with two more fist-size clumps in the tree, and one little bunch on the light the homeowners had brought out to help last night. Most of the bees, though, were in the box. That was the first good thing. The second one was that I had brought a hooded sweatshirt to put on over my helmet, trying to prevent any more incursions. I'd also brought a better spray bottle of sugar water to help calm them -- the one from last night was a little "spitty." 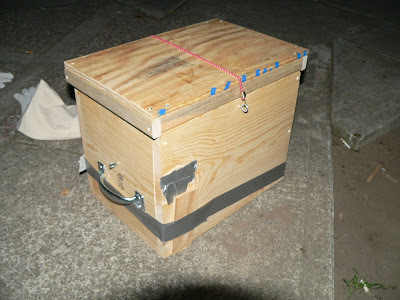 So I sprayed the bees, and used a paintbrush (I also have a "bee brush" on order, along with a better suit and a zip-down hood/veil) to kind of push them up into the box. If I went slowly enough, they just sort of got the hint and moved in. Spouse cut the little twigs the two clumps were on, and I carried them down to the box and nudged them in. Same with the group on the light. Then we tried to gather some off of the groundsheet, which is a pink-striped bedsheet I got from my grandmother's estate. I like to think of her when I spread it at the beach or under a swarm of bees. . . but gathering the bees didn't work so well. I ended up just brushing off the stragglers and shaking the sheet and myself off on the way to the car. We covered the box (again, pictures later), and made certain there weren't any bees on the outside. The homeowners said wistfully, "Maybe we'll get some honey?" That's usually the polite thing to do, so I will give them some soon. Some beekeepers charge for removal, but there was still a fist-sized lump of stragglers in the tree, and I told them to not walk barefoot for a day or two -- I don't know how professional they thought I was. Not yet enough to charge, plus I was pretty excited about getting the bees anyhow. In the car, my husband said, "I don't want them getting out on the way home." I pointed out a knothole, but he said it didn't go all the way through the box. And yet, when we were almost home, a bee flew forward into the dash area. I coaxed it outside, and didn't see any more, so I figured we were okay. Moved the swarm box back by the new hive, and ran to get the kids ready for church. 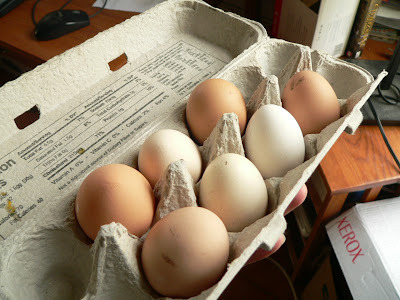 Afterwards, I went out to check them and they were clumped on the outside of the box. How? Well, that knothole did now go all the way through. I don't know if it had before. . . I was suited up, and started to move them into their new hive. I'm using a different hive system than before, with top bars instead of frames, and it was terrific to see that as I was pulling the bars from the swarm box, the bees were already chained together in the characteristic u-shape that the comb would take in the future. They weren't thrilled about being moved again. 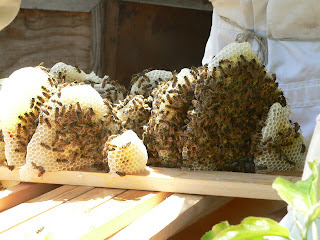 They were even less happy when I went and got the old hive and started dumping those bees into the new one. I figured now was the time, when they were so discombobulated, to try to mix the two together since there was only one queen. 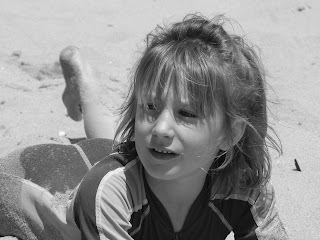 I think that's when I got stung. Somehow a couple of bees got up inside my jacket again and stung my side. Since I couldn't get to them, I just crushed my jacket against me, trying to rub out the stingers. I think that's when the second one decided to sting. Again, the smell made the bees kind of agitated, so I headed for the front yard. Some bees were stuck in between my veil and the sweatshirt hood, making that unmistakable "pinched bee" high whine. The adrenaline from the stings plus the noise they were making was pretty upsetting. I yelled for help, and Eric came out and tried to get them off, but there were a few determined bees that kept coming back as I brushed them off. After walking halfway up and halfway down the block, I got all of them off and he helped me get the sweatshirt/veil combination off without more stings. The bees were flying in big loops above the coop and around the yard. I hoped they were just trying to get the lay of the land, but I wasn't going to go out there and talk to them about it. Then I cleaned the house and went to my brother in law's birthday party. 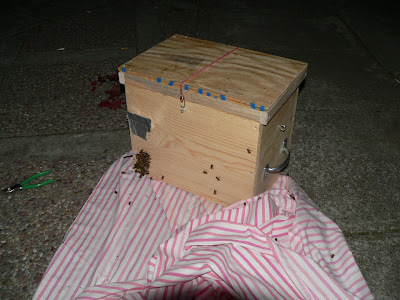 All during the end of the party, I was worrying that the bees would have swarmed away, that they would have reoccupied the hive I tried to empty into the new one, because it still has frames of honey, or that they would still be highly aggressive when I got home. Since the hive is right by the gate to the chicken coop, that would be very bad. But they had all calmed right down. I nudged one bar over as far as I could, and put the top on. I'll have to get in there and move one of the bars around, but it can be left for a week or two. Enough time maybe for them to orient themselves and start drawing comb, but more importantly, enough time for my new gear to show up.